Tottenham Hotspur's South Korean attacker Son Heung-min has scored his six goal of the season at the top European club football tournament. Son scored his team's second goal in Spurs' 3-0 win over Apoel FC in their last group stage match at the UEFA Champions League at Wembley Stadium in London on Wednesday (local time). 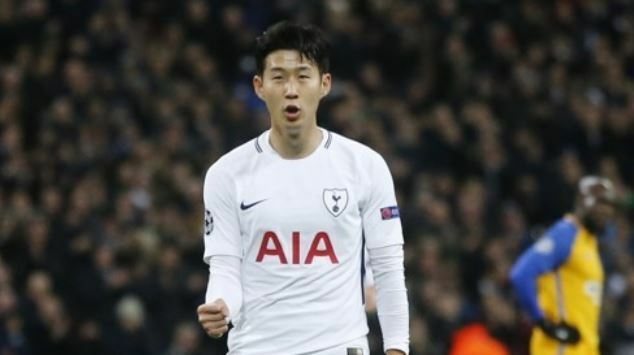 This was Son's third Champions League goal and his sixth total in the 2017-18 season. He has three goals in the English Premier League. Son has now scored in two straight matches for Spurs, following his goal against Watford in the EPL campaign Saturday. Spurs had already secured the top spot in Group H before their match against the Cypriot side Apoel. Mauricio Pochettino's side won the group with five wins and one draw, three points ahead of Spanish giants Real Madrid, which edged Borussia Dortmund 3-2 to wrap up their group stage action. Both Tottenham and Madrid will advance to the round of 16. With Spurs resting core players like Harry Kane, Christian Eriksen and Hugo Lloris, Son started as left winger in Pochettino's 4-2-3-1 system. After Spanish striker Fernando Llorente opened the scoring 20th minutes after the kickoff, Son doubled the lead for the London club in the 37th.